To mark the 150th anniversary of Abraham Lincoln's assassination, Springfield was the site of the re-enactment of Lincoln's funeral May 2 and 3, 2015. The weather was gorgeous; the entire event was historically accurate and beautifully executed by devoted volunteers. CSPAN3 covered it and you can watch much of it here along with some other related features. Since the original hearse was destroyed in a fire long ago, a replica of that hearse was built from scratch in Arizona by military veterans. Be sure to watch that clip, too, at the CSPAN3 link. Local (Springfield IL) funeral director PJ Stabb took it upon himself to coordinate and guarantee funding for the replica hearse project. Once built, the challenge was getting it from Arizona to Springfield. After the original travel arrangements by military air transport fell through, Tom and Karen Paisley (Underfanger Moving & Storage) called upon Mayflower Transit to come to the rescue. Mayflower deadheaded a driver, John McCarthy from California to Arizona, and he saved the day ...in more ways than one! As the trip from Arizona to Springfield progressed, the Mayflower driver found that the hearse had structural issues. Here's an article from our local newspaper today that describes what happened next. And Tom Paisley adds this: "The only thing not covered in the paper was the very professional driver who, by checking his load at different times during the trip, detected the structural design defects in the hearse & the issues they were creating. He used equipment on board to jack up the unit & attached additional straps & supports to minimize the structural collapse which was beginning to occur. On Tuesday, he sent pictures to PJ, detailing the problems. By doing this, he was able to give a 24-hour notice to start lining up the troops to correct the problem. The response by the Selvaggios and Zaras was incredible! All the cooperation and teamwork from the Springfield community makes me proud to be a part of it! 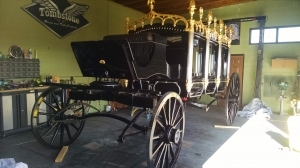 The lucky thing about this: If the structural problems had not become evident during shipping, the hearse would have collapsed during the event! A 20-minute delivery took 2 days! Driver John McCarthy stayed with it and had to re-arrange his whole reload to accommodate. He persevered through the whole process without a single complaint! I know he felt the historical importance of this shipment!" Once again, professional movers have saved the day. We are proud!